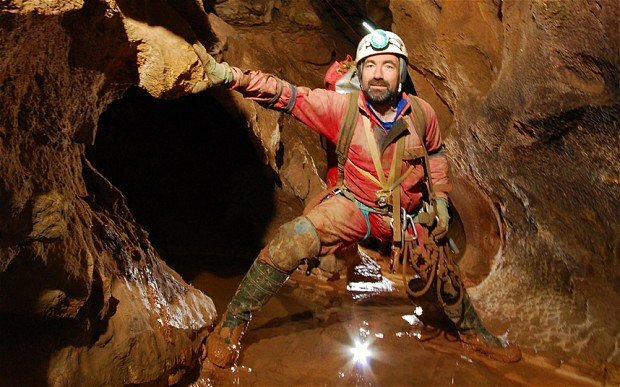 German caver Johann Westhauser has been brought to the surface after being trapped 3,300ft underground for 12 days. Johann Westhauser, 52, is reported to be conscious but the extent of his head and chest injuries is still unclear. Two doctors accompanied him to the surface and after initial checks he was airlifted to hospital. Johann Westhauser was badly hurt in a rock fall on June 8 while exploring Germany’s deepest cave, near the Austrian border. A medical team and helicopters were waiting as he left the cave at 11:44 local time. Mountain rescue service chief Klemens Reindl, who supervised the operation, said 728 people from five countries had taken part. The precarious rescue was beset with difficulties because of the deep shafts and narrow passages in the cave. It involved rest periods in five bivouac stops, followed by a major final hoist up a 600ft vertical shaft near the entrance to the cave. A motorized winch could not be used because of the potential risks to Johann Westhauser, and he had to be hauled up manually on a fiberglass stretcher. The injured man was one of the explorers who in 1995 originally discovered the cave, which they named Riesending (“Giant thing”) because of its depth and size. He had been on a trip during the Whitsun holiday when he suffered severe head and chest injuries at least 3,300ft underground. Johann Westhauser works at the Institute for Applied Physics at the Karlsruhe Institute of Technology, but it is not known if he went into the complex (as he had done many times before) as part of his research or as a hobby.